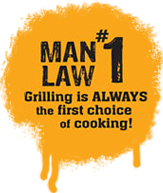 Hi there ... welcome to Man Law BBQ Tools - the best BBQ tools you'll ever own! Man Law BBQ Grill Topper - turn any BBQ (even those public BBQ's) into a clean work surface. Gives you grill plate & perforated sections! Man Law BBQ Skillet - cook those small items (veg, prawns, chicken nuggets, etc) on the grill for that smoky BBQ flavour - perfect & non-stick! Man Law Cast Iron Reversible Griddle - cook steaks, bacon & eggs, lamb chops evenly and perfectly over the grill & get those lovely grill lines too! Man Law Chicken Rack - cook up to 12 wings or drummies at once, evenly & no mess or burnt marinade - even serve using the rack - yummm! There’s nothin’ more Aussie than a BBQ.Get some mates together, throw some meat over the coals and catch up over a cold one while you watch the kids play back yard footy. Whether it’s a steel sheet held up with 4 bricks in the middle of the lawn or the big 6 burner gas job with a stainless steel hood, MAN LAW dictates that you need the best tools. MAN LAW Premium BBQ Tools, designed in the US, are the best. Start out right and they’ll last a lifetime. 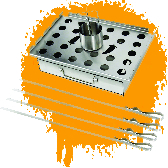 Quality BBQ Tools developed in the US by Men for Men. They also realized that all true BBQ masters live by an unwritten list of rules. Thus, MAN LAW™ was born, and those rules were written. Click HERE to go straight to our ON LINE SHOP - Products dispatched same day! Download a pdf version of our Man Law product catalog.